SIGNING THE CONSTITUTION OF THE PHILIPPINE COMMONWEALTH, 23 MARCH 1935. 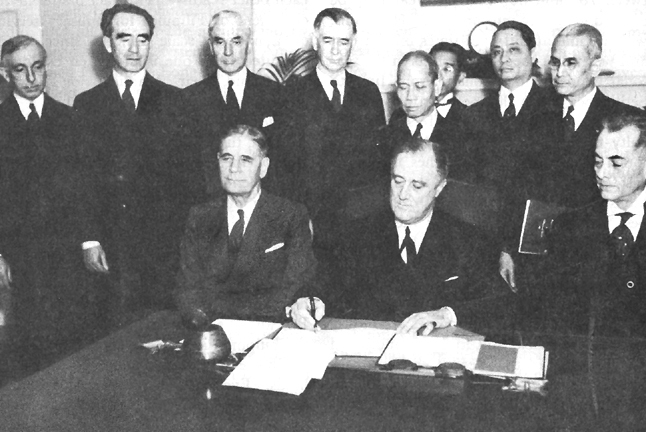 Seated, left to right: George H. Dern, Secretary of War; President Franklin D. Roosevelt, signing the Constitution of the Philippine Commonwealth; Manuel L. Quezon, President, Philippine Senate; standing, left to right: Brig. Gen. Creed F. Cox, Chief, Bureau of Insular Affairs, War Department; Frank Murphy, Governor General of the Philippine Islands; Cordell Hull, Secretary of State; Key Pittman, Chairman, Foreign Relations Committee, U.S. Senate; Pedro Guevara, Philippine Resident Commissioner; Miguel Cuaderno, Vice President, Philippine National Bank, Manila, P. I.; Manuel Roxas, Representative, Philippine Legislature, Delegate, Constitutional Assembly; Francisco A. Delgado, Philippine Resident Commissioner.